Line movement - The line opened at the key number of three and has been moving solidly upwards since - it can be found at five in several places. There is no surprise in that movement - Stanford has drawn a large majority of the action. The total opened at 60, and has shown slight movement downward. Pick - I am solidly with the majority of bettors in this one. Stanford is among the most impressive teams in the country so far. Andrew Luck has been brilliant, the defense has been very good, and they couldn’t be playing with more confidence. They are getting noticed, but not nearly as much as they should be, and they are still providing some nice value - as this price shows. Notre Dame has suffered demoralizing losses in their last two - against teams with a lot of talent but some obvious flaws both times. They have been shredded on the ground in both games, and Stanford can run. They have also had issues against confident QBs, and Luck is certainly confident. Notre Dame’s best player this year on offense has been Armando Allen, and he’s banged up and won’t be at 100 percent. Stanford would be the better team here if both teams were at their best, but it’s fair to assume that Notre Dame is mentally less than their best, and they haven’t yet fully embraced what Brian Kelly wants them to do. Stanford is further ahead in their process, and they are going to win this one handily. Line Movement - This game opened up at 16 for the college football lines, but has climbed gradually as Boise State has drawn more and more of the action. About 60 percent of the total bets have been on the Broncos, and that’s consistent with the line movement. The betting volume has also been reasonably high for the Broncos because of the primetime start time and the “GameDay” attention. The total opened as low as 54.5 and has moved to 57. Pick - I love Boise State. I am absolutely and certainly one of those people who believes that they belong in the BCS Championship Game if Alabama or Ohio State stumbles. 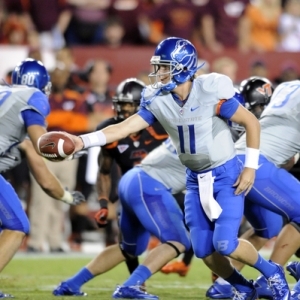 I couldn’t be more impressed by Kellen Moore and the tools around him. I think Chris Petersen is one of the three or four best coaches in the country. At least. All that being said, I have no questions here - I am backing Oregon State. I am confident that Boise State will win this one, but this number is just too big. Oregon State is going to be fired up for this one, they showed that they can play well against very tough opponents when they covered against TCU, and they are going to have some tricks on offense to show the Broncos. I don’t give the Beavers a lot of chance of winning, but I give them a very good chance of keeping it reasonable, and having the line on the friendly side of 17 is therefore very attractive. I also really like how Mike Riley has his team ready to play on the road - the Beavers have covered 10 of their last 11 away form home. Vegas Sports Informer has a college football handicapping goal of putting up +150 units for his NFL and college football picks for 2010-11. He looks to advance on that goal this weekend with a 5-Unit College Football Game of the Week on Saturday and a 6-Unit NFL Game of the Month on Sunday. Find out why this Vegas insider is terrifying the bookies in Sin City and across the globe. Click Here for more information on his picks.